Since part of its effectiveness lies with the many unusual elements of the plot, I suggest that you skip over the next two paragraphs if you have yet to watch The Frighteners. Even though I won't give away real spoilers, it's best if you know nothing about The Frighteners the first time you watch. The underrated Michael J. Fox plays Frank Bannister, a psychic "con man" of sorts. 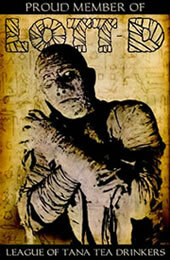 He scours the paper for funerals, and preys on the survivors. Only, there's more to it than that. Bannister actually has a trio of ghosts (and one ghost's dog) in his employ. Bannister dispatches them to the survivors' homes to engage in poltergeist activity--while making sure that they strategically drop of one Bannister's business cards. They panic, call Bannister for some quick, Ghostbusters-ish exorcisms, Bannister comes in, chants some gobbledy-gook, cranks up some ridiculous machinery, then rids the home of spooks for a healthy fee. Only, after one particularly ridiculous exorcism, there seems to be some spook activity that he's not responsible for. 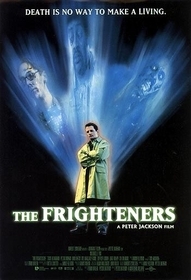 The remainder of The Frighteners focuses on the source of the other spook activity, Bannister's connection to it, if any, and his small community's attempt to rid themselves of it. It might not sound that unusual, but the way that director Peter Jackson presents the fictional world of The Frighteners is very unusual and brilliant, and it takes some getting used to. For at least the first 40 minutes of the film, few relationships between characters are what you'd expect. Odd occurrences take place that Bannister accepts as casually as the mailman arriving. Jackson gives us an enjoyable, amusing and frightening world wherein little unfolds as we'd guess--at least in the first half. Adding to the quality of the first half is the opening, which comes on like gangbusters. Jackson wastes no time before sticking us into a scary haunted-house chase scene of the sort that's usually reserved for climaxes. Lots of the incredible effects are displayed right out of the box, and the scene is exhilarating. It nicely enables the exposition to give us some time to breathe as we are introduced to the major players. There are some unfortunate embraces of conventions in the second half. Not that they are that bad in themselves--films don't have to be completely unpredictable, shun conventions, or even avoid archetypes and cliches for me to like them, but the acceptance of genre norms in the second half is a bit out of character and deposits you in another, slightly less enjoyable aesthetic space. Still, that shouldn't stop anyone from watching this film. One of the most exquisite elements is the odd effect of the mixture of attitudes. Jackson vacillates so quickly from humor to horror to light drama that you rarely know how to react, and that's a good thing in my opinion. Even better, he achieves that blend by mixing up his paints, so to speak, and using the "wrong" ones at various times. Humor is attained with elements that should be scary. Scary parts come at unexpected times, etc. At heart, though, The Frighteners is very Ghostbusters-ish (which certainly isn't a bad thing to be), and will probably appeal most to fans of that film. The effects aren't better here, necessarily, than in Ghostbusters, but they are certainly as good. They were also a clear influence on 1999's The Haunting, so if you enjoyed The Haunting at least for the effects, you should find that much to enjoy in The Frighteners, as well. The plot, as its twists and turns unfold, is actually quite complex. Screenwriters Fran Walsh and Jackson never mire you in a muddle, though. Both the script and the performances are excellent, and should be admired by any fans of all genres--not just horror fanboys such as myself. Michael J. Fox is really a marvelous actor, and Trini Alvarado is no slouch. Fans of quirky, sometimes hammy performances should love Peter Dobson in both human and ghost form, and Jeffrey Combs is incredibly weird and creepy. Dee Wallace-Stone gives us a nice turnaround two-thirds of the way through the film, and her mom, played by Juliana McCarthy, provides another pleasant ham sandwich, even if we don't get a full lunch hour with her. The Frighteners is very well balanced--no element is overbearing, including the effects, which could have easily been the case. A bit more serious and complex than Ghostbusters, but lighter than Evil Dead, The Frighteners is a must see for all horror fans with a sense of humor.